2 An income statement for a hypothetical manufacturing company that you can refer to as we proceed through the chapter. Before we discuss the specific components of an income statement in much depth, let’s take a quick look at the general makeup of the statement. 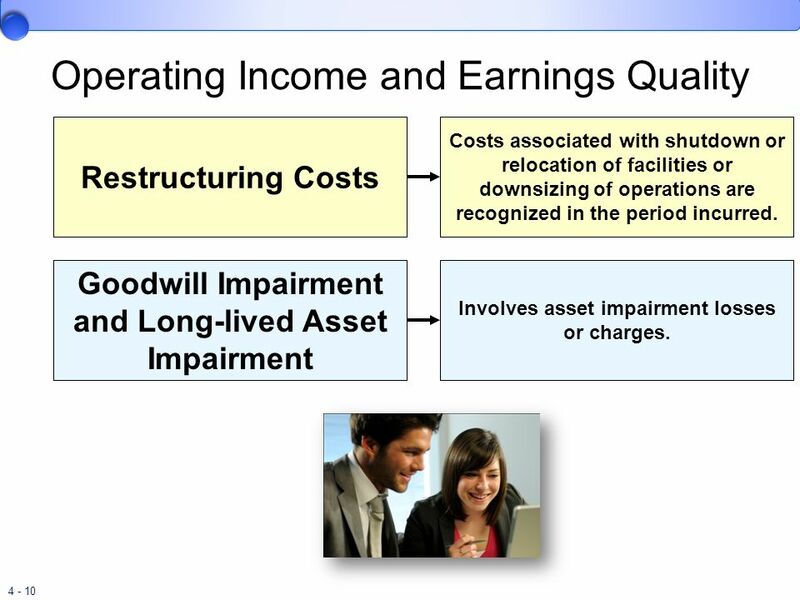 The graphic on this slide illustrates an income statement for a hypothetical manufacturing company that you can refer to as we proceed through the chapter. At this point, our objective is only to gain a general perspective of the items reported and classifications contained in corporate income statements. Notice the three general areas include income from continuing operations, separately reported items, and earnings per share. Revenues Inflows of resources resulting from providing goods or services to customers. Expenses Outflows of resources incurred in generating revenues. Gains and Losses Increases or decreases in equity from peripheral or incidental transactions of an entity. Income Tax Expense Because of its importance and size, income tax expense is a separate item. The need to provide information to help analysts predict future cash flows emphasizes the importance of properly reporting the amount of income from the entity’s continuing operations. Clearly, it is the operating transactions that probably will continue into the future that are the best predictors of future cash flows. 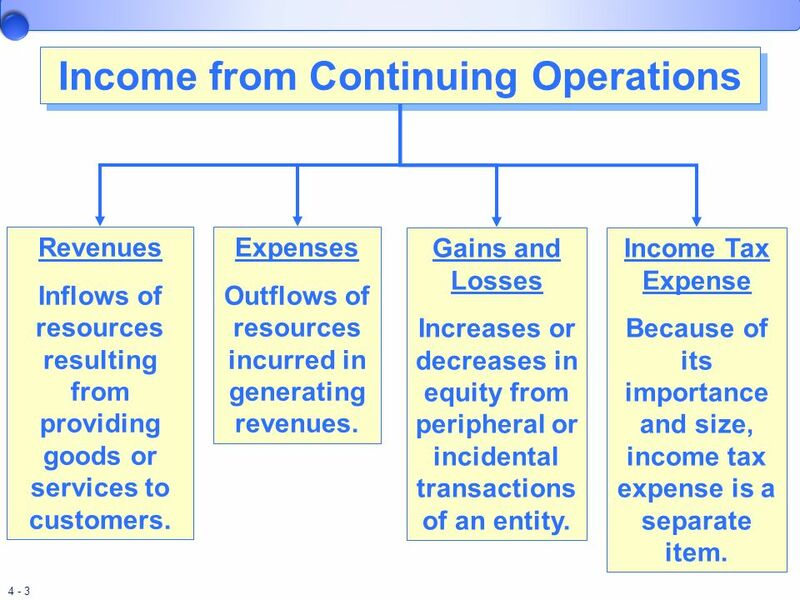 The components of income from continuing operations are revenues, expenses (including income taxes), gains, and losses, excluding those related to discontinued operations and extraordinary items. Revenues are inflows of resources resulting from providing goods or services to customers, such as sales revenue. Expenses are outflows of resources incurred in generating revenues, such as cost of goods sold and operating expenses. Gains and losses are increases or decreases in equity from peripheral or incidental transactions of an entity. In general, these gains and losses are those changes in equity that do not result directly from operations but nonetheless are related to those activities. For example, gains and losses from the routine sale of equipment, buildings, or other operating assets and from the sale of investment assets normally would be included in income from continuing operations. Income tax expense is reported separately because of its importance and size. 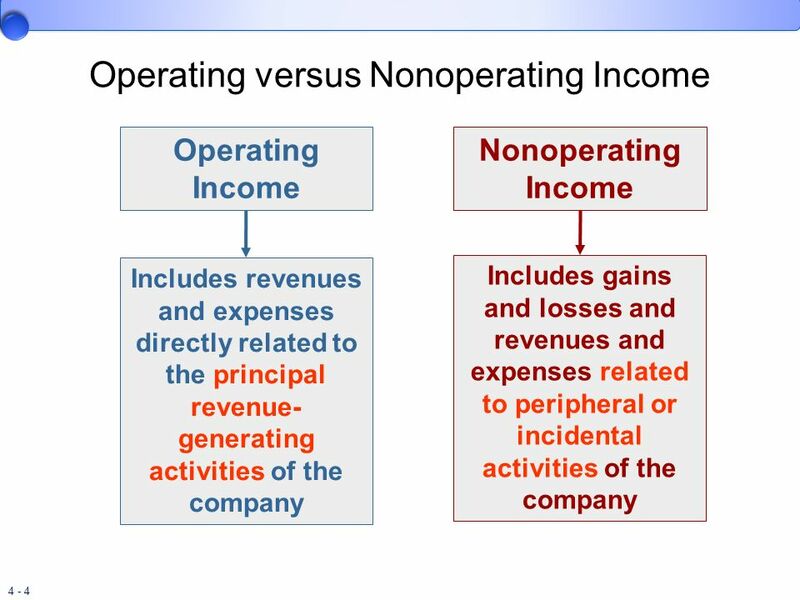 Includes revenues and expenses directly related to the principal revenue-generating activities of the company Includes gains and losses and revenues and expenses related to peripheral or incidental activities of the company Many corporate income statements distinguish between operating income and nonoperating income. Operating income includes revenues and expenses directly related to the primary revenue-generating activities of the company. For example, operating income for a manufacturing company includes sales revenues from selling the products it manufactures as well as all expenses related to this activity. Similarly, operating income might also include gains and losses from selling equipment and other assets used in the manufacturing process. On the other hand, nonoperating income relates to peripheral or incidental activities of the company. For example, a manufacturer would include interest and dividend revenue, gains and losses from selling investments, and interest expense in nonoperating income. Other income (expense) often is the classification heading companies use in the income statement for nonoperating items. On the other hand, a financial institution like a bank would consider those items to be a part of operating income because they relate to the principal revenue generating activities for that type of business. Proper Heading Revenues & Gains Expenses & Losses No specific standards dictate how income from continuing operations must be displayed, so companies have considerable latitude in how they present the components of income from continuing operations. This flexibility has resulted in a variety of income statement presentations. However, we can identify two general approaches, the single-step and the multiple-step. 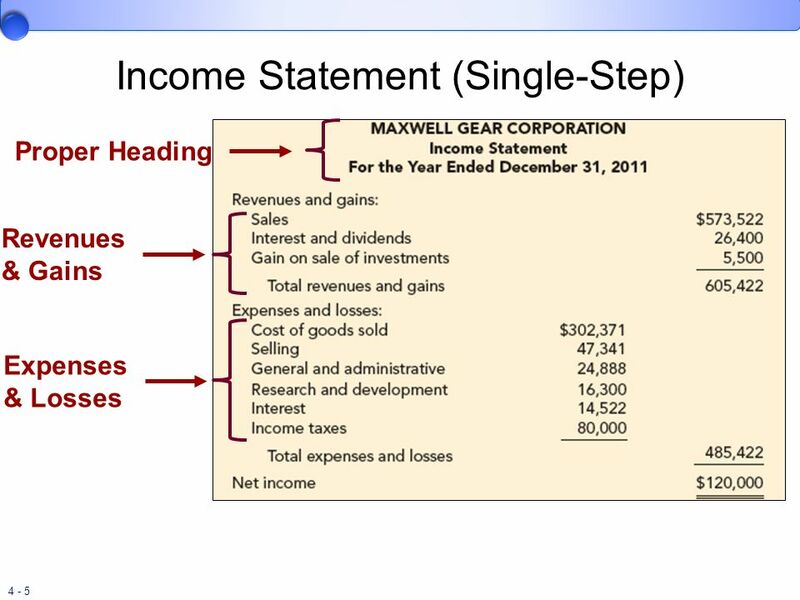 This slide illustrates an example of a single step income statement for a hypothetical manufacturing company, Maxwell Gear Corporation. The single-step format first lists all the revenues and gains included in income from continuing operations. Then, expenses and losses are grouped, subtotaled, and subtracted—in a single step—from revenues and gains to derive income from continuing operations. Operating and nonoperating items are not separately classified. Proper Heading Gross Profit Operating Expenses Non- operating Items The multiple-step income statement format includes a number of intermediate subtotals before arriving at income from operations. However, notice that the net income is the same no matter which format is used. A primary advantage of the multiple-step format is that, by separately classifying operating and nonoperating items, it provides information that might be useful in analyzing trends. Similarly, the classification of expenses by function also provides useful information. 7 Some differences are highlighted below. 8 Earnings Quality Earnings quality refers to the ability of reported earnings to predict a company’s future earnings. Transitory Earnings versus Permanent Earnings Financial analysts are concerned with more than just the bottom line of the income statement—net income. 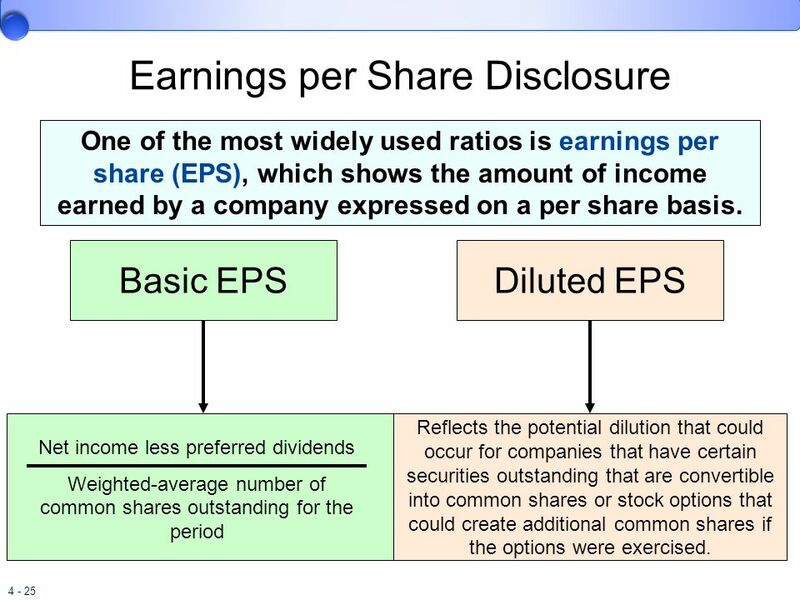 The presentation of the components of net income and the related supplemental disclosures provide clues to the user of the statement in an assessment of earnings quality. 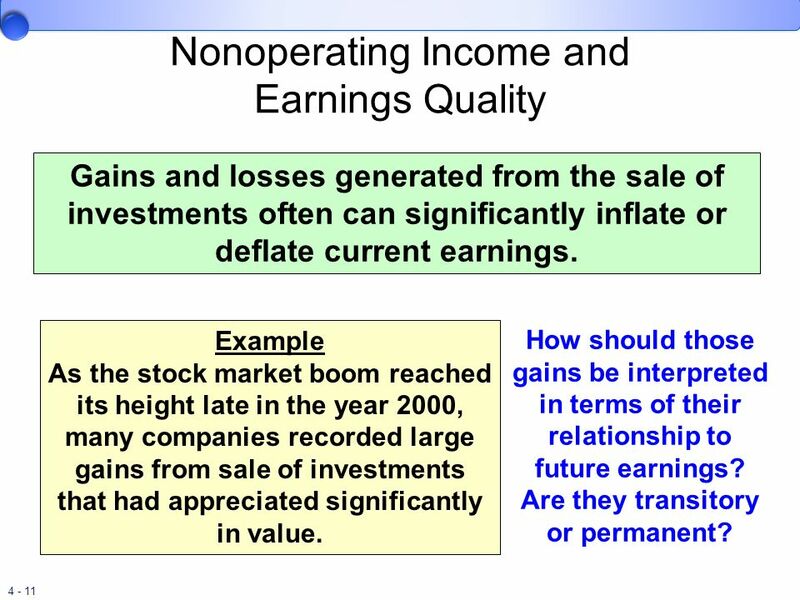 Earnings quality is used as a framework for more in-depth discussions of operating and nonoperating income. 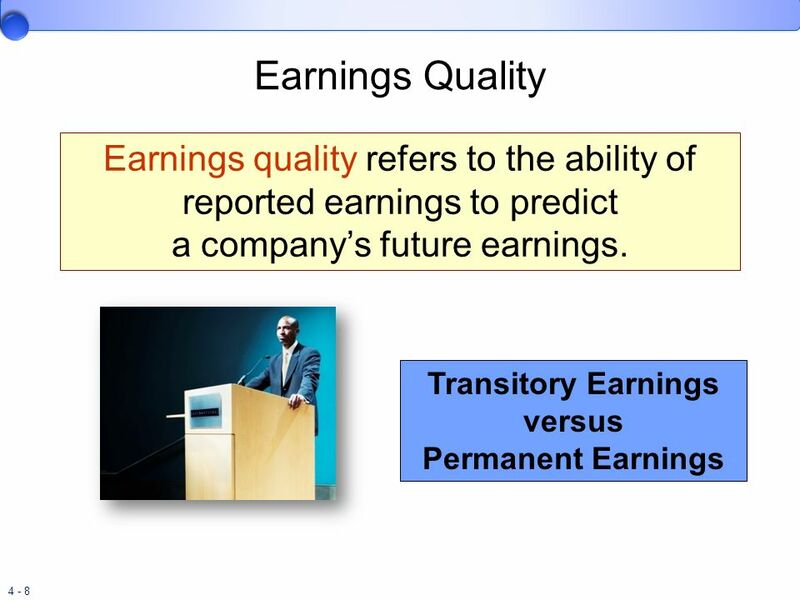 Earnings quality refers to the ability of reported earnings to predict a company’s future. The relevance of any historical-based financial statement hinges on its predictive value. To enhance predictive value, analysts try to separate a company’s transitory earnings effects from its permanent earnings. Transitory earnings effects result from transactions or events that are not likely to occur again in the foreseeable future, or that are likely to have a different impact on earnings in the future. 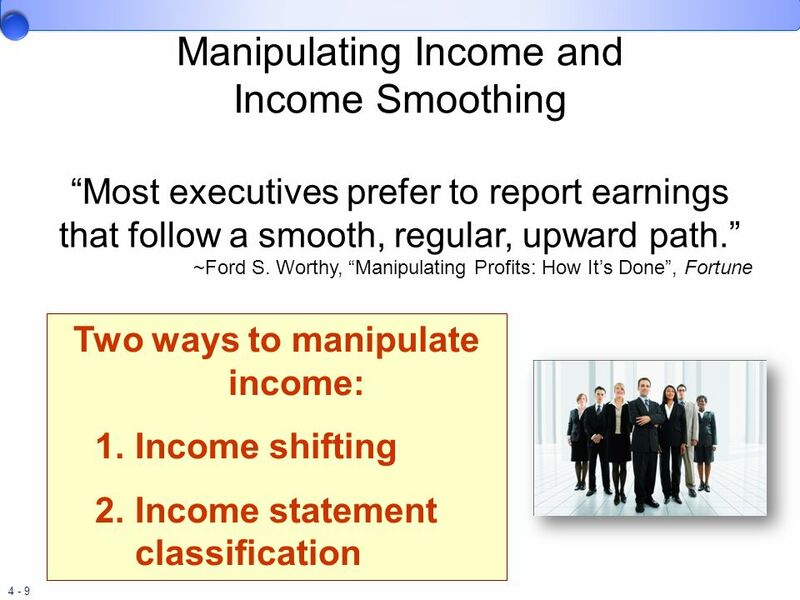 “Most executives prefer to report earnings that follow a smooth, regular, upward path.” ~Ford S. Worthy, “Manipulating Profits: How It’s Done”, Fortune Two ways to manipulate income: Income shifting Income statement classification An often-debated contention is that, within GAAP, managers have the power, to a limited degree, to manipulate reported company income. And the manipulation is not always in the direction of higher income. In a Fortune article titled “Manipulating Profits: How It’s Done” Ford S. Worthy states that “Most executives prefer to report earnings that follow a smooth, regular, upward path. They hate to report declines, but they also want to avoid increases that vary wildly from year to year; it’s better to have two years of 15% earnings increases than a 30% gain one year and none the next. As a result, some companies ‘bank’ earnings by understating them in particularly good years and use the banked profits to polish results in bad years.” How do managers manipulate income? Two major methods are (1) income shifting and (2) income statement classification. Income shifting is achieved by accelerating or delaying the recognition of revenues or expenses. For example, a practice called “channel stuffing” accelerates revenue recognition by persuading distributors to purchase more of your product than necessary near the end of a reporting period. The most common income statement classification manipulation involves the inclusion of recurring operating expenses in “special charge” categories such as restructuring costs. This practice sometimes is referred to as “big bath” accounting, a reference to cleaning up company balance sheets. Asset reductions, or the incurrence of liabilities, for these restructuring costs result in large reductions in income that might otherwise appear as normal operating expenses either in the current or future years. Restructuring Costs Costs associated with shutdown or relocation of facilities or downsizing of operations are recognized in the period incurred. Goodwill Impairment and Long-lived Asset Impairment Involves asset impairment losses or charges. Should all items of revenue and expense included in operating income be considered indicative of a company’s permanent earnings? No. Operating expenses may include unusual items that may or may not continue in the future. Restructuring costs are recognized in the period the exit or disposal cost obligation actually is incurred. As an example, suppose terminated employees are to receive termination benefits, but only after they remain with the employer beyond a minimum retention period. In that case, a liability for termination benefits, and corresponding expense, should be accrued in the period(s) the employees render their service. On the other hand, if future service beyond a minimum retention period is not required, the liability and corresponding expense for benefits are recognized at the time the company communicates the arrangement to employees. In both cases, the liability and expense are recorded at the point they are deemed incurred. Similarly, costs associated with closing facilities and relocating employees are recognized when goods or services associated with those activities are received. GAAP also establishes that fair value is the objective for initial measurement of the liability, and that a liability’s fair value often will be measured by determining the present value of future estimated cash outflows. Goodwill Impairment and Long-lived Asset Impairment involves asset impairment losses or charges. Any long-lived asset, whether tangible or intangible, should have its balance reduced if there has been a significant impairment of value. We explore property, plant, and equipment and intangible assets in Chapters 10 and 11. After discussing this topic in more depth in those chapters, we revisit the concept of earnings quality as it relates to asset impairment. Gains and losses generated from the sale of investments often can significantly inflate or deflate current earnings. Example As the stock market boom reached its height late in the year 2000, many companies recorded large gains from sale of investments that had appreciated significantly in value. How should those gains be interpreted in terms of their relationship to future earnings? Are they transitory or permanent? Most of the components of earnings in an income statement relate directly to the ordinary, continuing operations of the company. Some, though, such as interest and gains or losses are only tangentially related to normal operations. These we refer to as nonoperating items. Some nonoperating items have generated considerable discussion with respect to earnings quality, notably gains and losses generated from the sale of investments. For example, as the stock market boom reached its height late in the year 2000, many companies recorded large gains from sale of investments that had appreciated significantly in value. How should those gains be interpreted in terms of their relationship to future earnings? Are they transitory or permanent? Companies often voluntarily provide a pro forma earnings number when they announce annual or quarterly earnings. Supposedly, these pro forma earnings numbers are management’s view of “permanent earnings,” in the sense of being a better long-run performance measure. These pro forma earnings numbers are controversial because determining which items to exclude is at the discretion of management. Therefore, management could mislead investors. Nevertheless, these disclosures do represent management’s perception of what its permanent earnings are and provides additional information to the financial community. Reported separately, net of taxes: Discontinued operations Extraordinary items Generally accepted accounting principles require that certain transactions be reported separately in the income statement, below income from continuing operations. There are two types of events that, if they have a material effect on the income statement, require separate reporting below income from continuing operations as well as separate disclosure: (1) discontinued operations and (2) extraordinary items. In fact, these are the only two events that are allowed to be reported below continuing operations. The presentation order is as shown on the slide. The objective is to separately report all the income effects of each of these items. 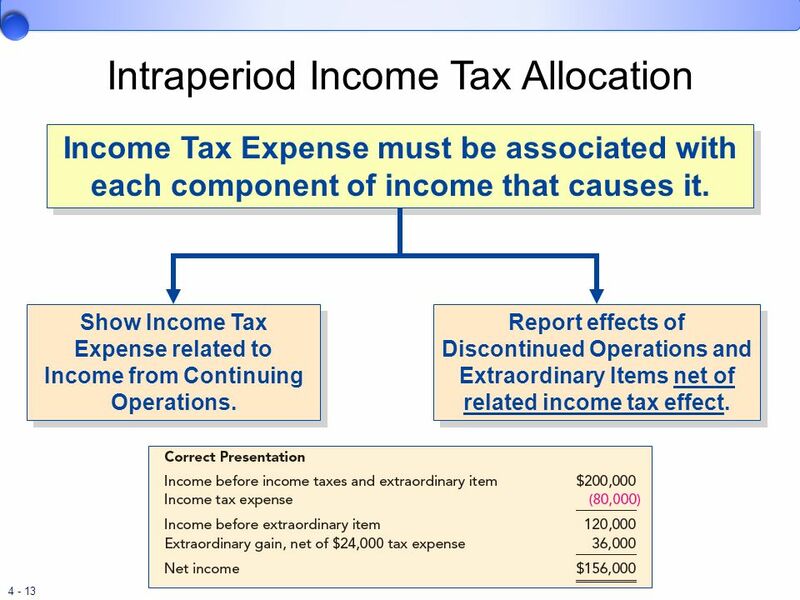 The process of associating income tax effects with the income statement components that create them is referred to as intraperiod tax allocation, which we will address in the next section. A third separately reported item, the cumulative effect of a change in accounting principle, might be included for certain mandated changes in accounting principles. 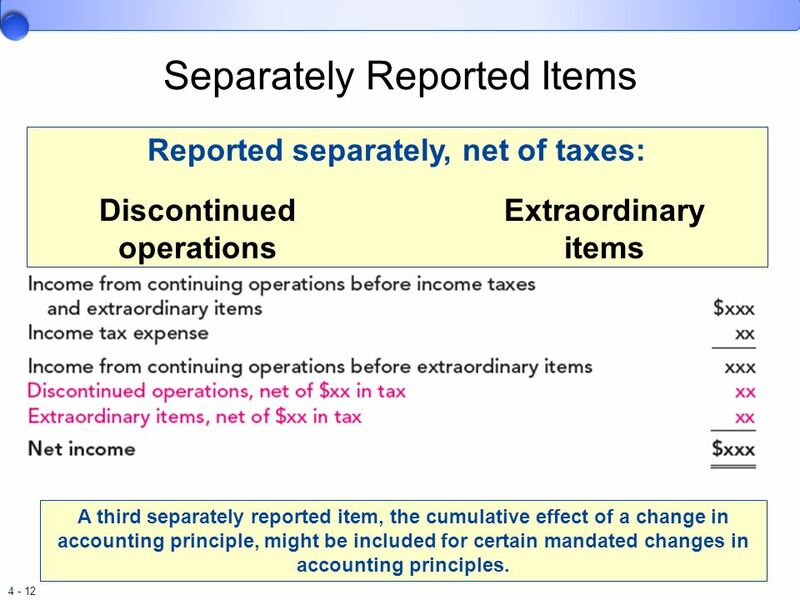 Before 2005, most voluntary changes in accounting principles also were treated this way, by including the cumulative effect on the income of previous years from having used the old method rather than the new method in the income statement of the year of change as a separately reported item below extraordinary items. Now, most voluntary changes in accounting principles require retrospective treatment. We no longer report the entire effect in the year of the change. Instead, we retrospectively recast prior years’ financial statements when we report those statements again (in comparative statements, for example) so that they appear as if the newly adopted accounting method had been used in those years presented. 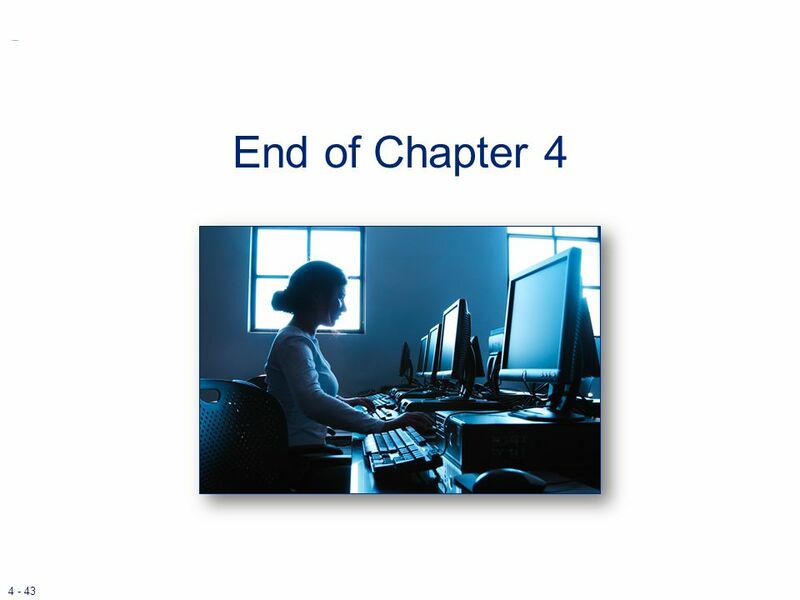 We discuss the retrospective approach later in this chapter and in subsequent chapters. A third separately reported item, the cumulative effect of a change in accounting principle, might be included for certain mandated changes in accounting principles. Income Tax Expense must be associated with each component of income that causes it. Show Income Tax Expense related to Income from Continuing Operations. Report effects of Discontinued Operations and Extraordinary Items net of related income tax effect. Part I Intraperiod tax allocation associates (or allocates) income tax expense (or income tax benefits if there is a loss) with each major component of income that causes it. As a result, the two items reported separately below income from continuing operations are presented net of the related income tax effect. For example, assume a company experienced an extraordinary gain during the year. The amount of income tax expense deducted from income from continuing operations is the amount of income tax expense that the company would have incurred if there were no extraordinary gain. The effect on income taxes caused by the extraordinary item is deducted from the extraordinary gain in the income statement. 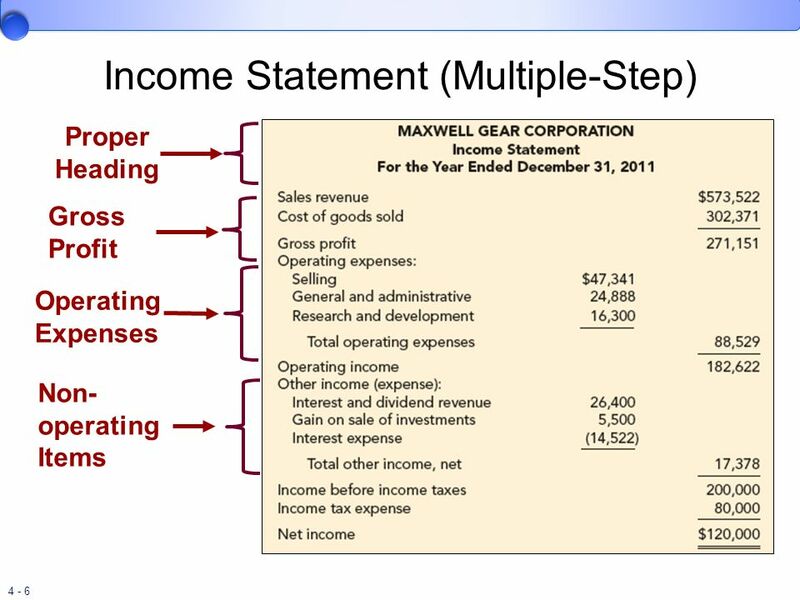 Part II Assume that the Maxwell Gear Corporation had income from continuing operations before income tax expense of $200,000 and an extraordinary gain of $60,000 in The income tax rate is 40% on all items of income or loss. Therefore, the company’s total income tax expense is $104,000 (40% × $260,000). However, as illustrated on this slide, the total tax expense of $104,000 must be allocated, $80,000 to continuing operations and $24,000 (40% × $60,000) to the extraordinary gain. 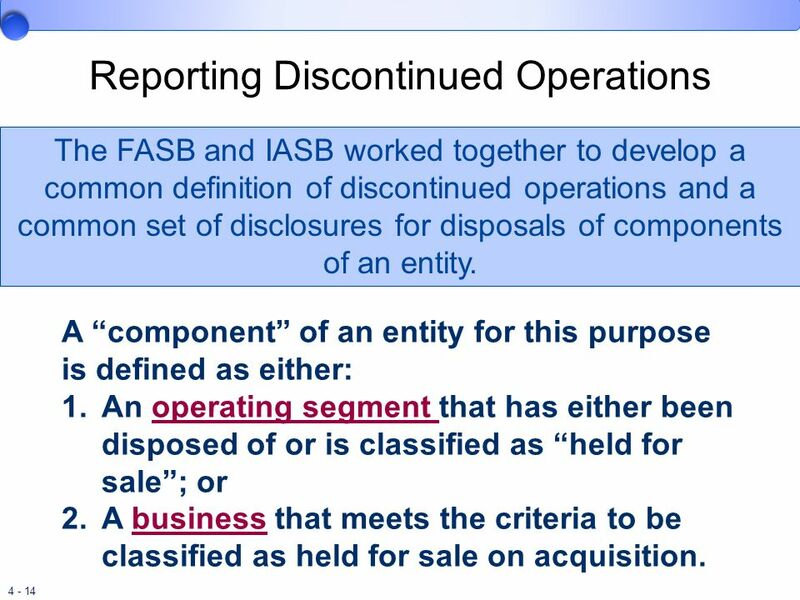 The FASB and IASB worked together to develop a common definition of discontinued operations and a common set of disclosures for disposals of components of an entity. A “component” of an entity for this purpose is defined as either: An operating segment that has either been disposed of or is classified as “held for sale”; or A business that meets the criteria to be classified as held for sale on acquisition. As part of the continuing process to converge U.S. GAAP and international standards, the FASB and IASB worked together to develop a common definition of discontinued operations and a common set of disclosures for disposals of components of an entity. The FASB issued an exposure draft (ED) that outlined the Boards’ preliminary position. At the time this text was published, a final pronouncement had not been issued. The ED defines a “component” of an entity for this purpose as either: An operating segment that has either been disposed of or is classified as “held for sale”; or A business that meets the criteria to be classified as held for sale on acquisition. An operating segment is a part of an enterprise: That may earn revenues and incur expenses. Whose operating results are regularly reviewed to make decisions about resources to be allocated to the segment and assess its performance. For which discrete financial information is available. A business that might be considered discontinued is defined the same as when accounting for business combinations, specifically: An integrated set of activities and assets. Capable of being conducted and managed to provide a return in the form of dividends, lower costs, or other economic benefits. Many were critical of prior U.S. GAAP for its broad definition of a component of the entity. In addition to achieving convergence with international standards, the new guidance, if finalized as outlined in the exposure draft, is expected to reduce the number of business segments that are considered to be components of the entity requiring separate income statement presentation. Reporting for Components Sold Operating income or loss of the component from the beginning of the reporting period to the disposal date. Gain or loss on the disposal of the component’s assets. Reporting for Components Held For Sale Operating income or loss of the component from the beginning of the reporting period to the end of the reporting period. An “impairment loss” if the carrying value of the assets of the component is more than the fair value minus cost to sell. 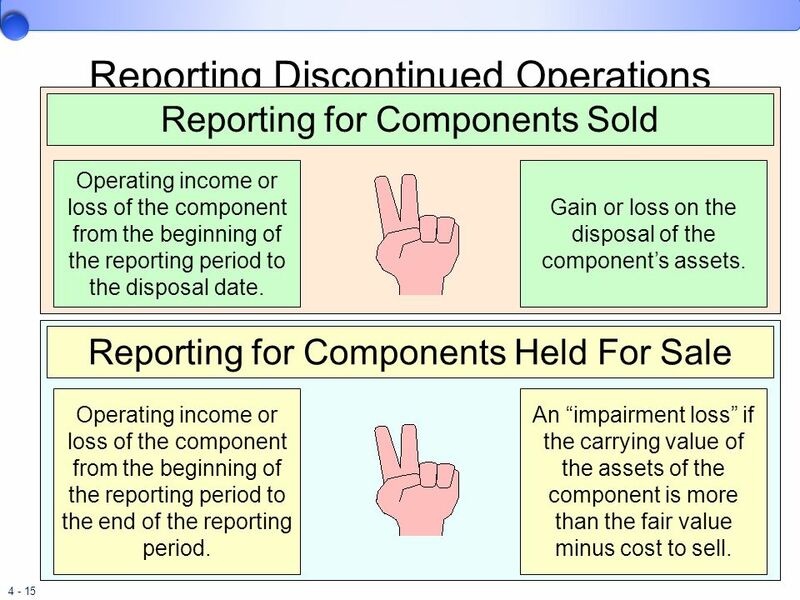 When a component has been sold, the reported income effects of a discontinued operation will include two elements: (1) Operating income or loss of the component from the beginning of the reporting period to the disposal date and (2) Gain or loss on the disposal of the component. When the component is considered held for sale, the reported income effects of a discontinued operation will include two elements: (1) Operating income or loss of the component from the beginning of the reporting period to the end of the reporting period and (2) An “impairment loss” if the carrying value of the assets of the component is more than the fair value minus cost to sell. 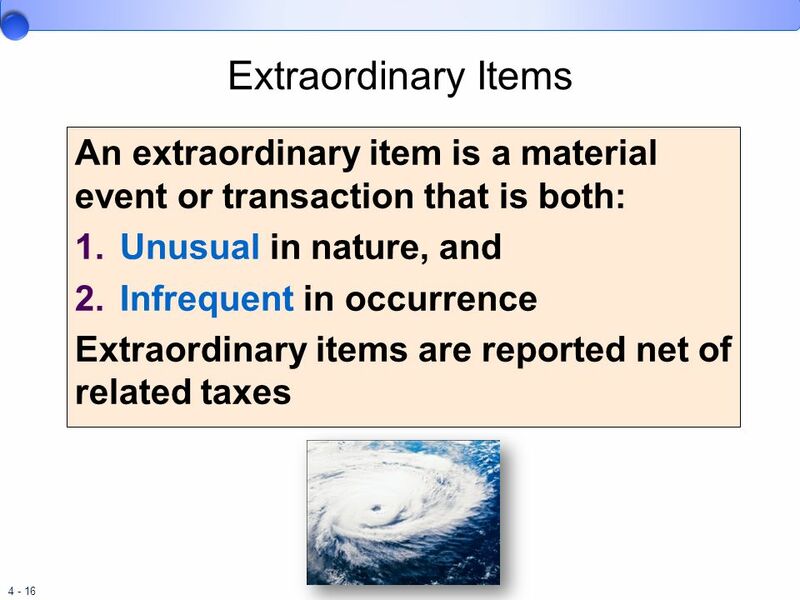 16 Extraordinary Items An extraordinary item is a material event or transaction that is both: Unusual in nature, and Infrequent in occurrence Extraordinary items are reported net of related taxes Extraordinary items are material events and transactions that are both unusual in nature and infrequent in occurrence and are reported net of related tax effects. These criteria must be considered in light of the environment in which the entity operates. There is obviously a considerable degree of subjectivity involved in the determination. A key point in the definition of an extraordinary item is that determining whether an event satisfies both criteria depends on the environment in which the firm operates. The environment includes factors such as the type of products or services sold and the geographical location of the firm’s operations. What is extraordinary for one firm may not be extraordinary for another firm. For example, a loss caused by a hurricane in Florida may not be judged to be extraordinary. However, hurricane damage in New York may indeed be unusual and infrequent. 17 the FASB to the elimination of the extraordinary item classification. 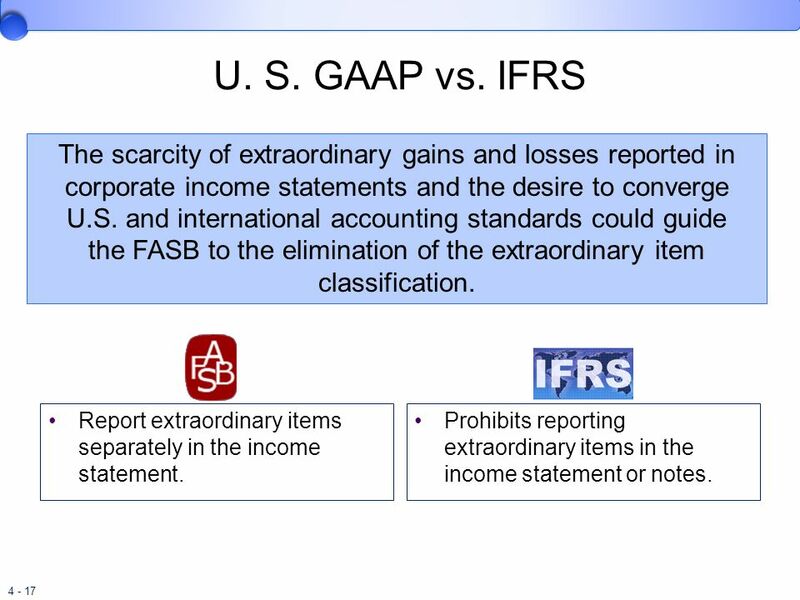 U. S. GAAP vs. IFRS The scarcity of extraordinary gains and losses reported in corporate income statements and the desire to converge U.S. and international accounting standards could guide the FASB to the elimination of the extraordinary item classification. 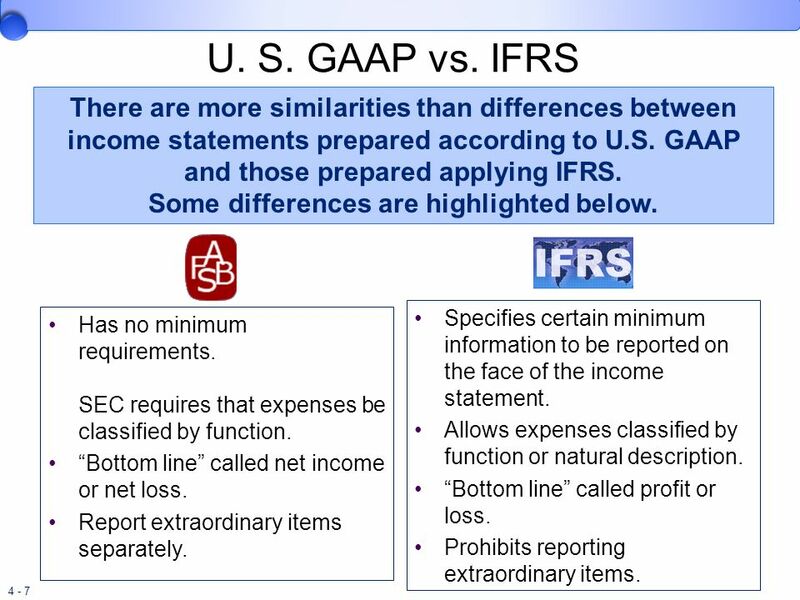 U.S. GAAP provides for the separate reporting, as an extraordinary item, of a material gain or loss that is unusual in nature and infrequent in occurrence. In 2003, the IASB revised IAS No. 1. The revision states that neither the income statement nor any notes may contain any items called “extraordinary.” A recent survey of 500 large public companies reported that only four of the companies disclosed an extraordinary gain or loss in their 2007 income statements. Losses from two 21st century “extraordinary” events, the September 11, 2001, terrorist attacks and Hurricane Katrina in 2005, did not qualify for extraordinary treatment. The treatment of these two events, the scarcity of extraordinary gains and losses reported in corporate income statements, and the desire to converge U.S. and international accounting standards could guide the FASB to the elimination of the extraordinary item classification. Report extraordinary items separately in the income statement. Prohibits reporting extraordinary items in the income statement or notes. Items that are material and are either unusual or infrequent—but not both—are included as separate items in continuing operations. 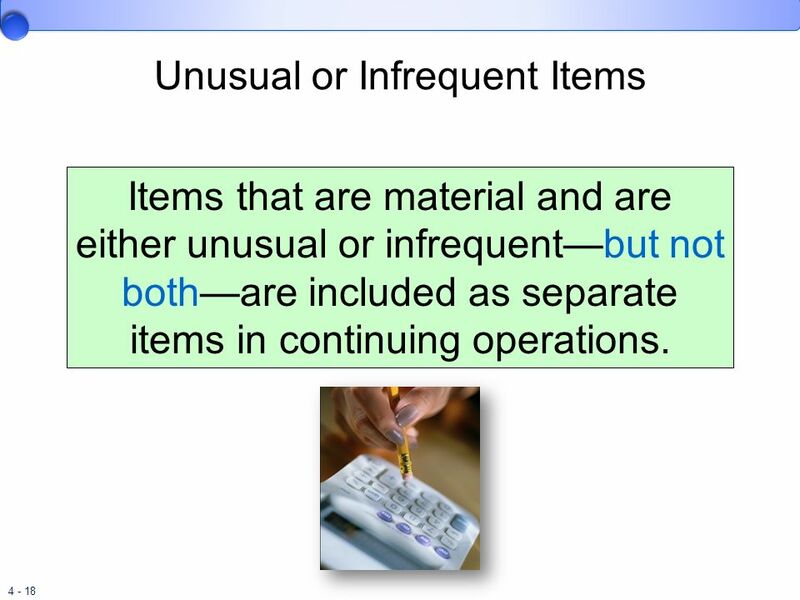 Items that are material and are either unusual or infrequent—but not both—are included as a separate item in continuing operations. 19 Accounting Changes Accounting changes fall into one of three categories: (1) a change in an accounting principle, (2) a change in an accounting estimate, or (3) a change in reporting entity. 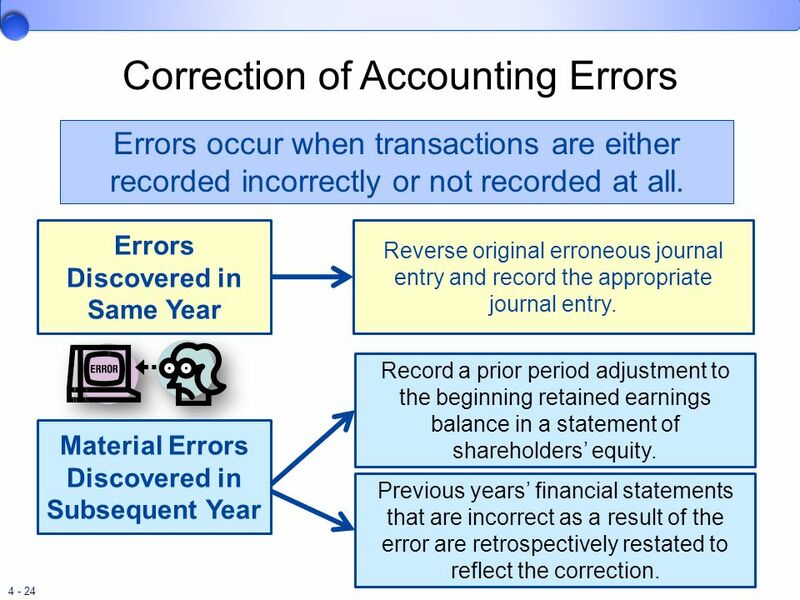 The correction of an error is another adjustment that is accounted for in the same way as certain accounting changes. 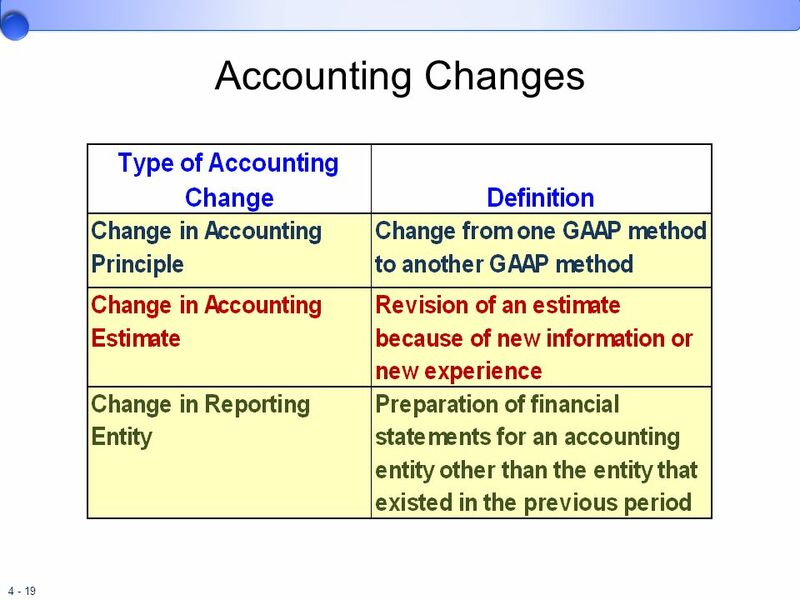 Occurs when changing from one GAAP method to another GAAP method, for example, a change from LIFO to FIFO GAAP requires that most voluntary accounting changes be accounted for retrospectively by revising prior years’ financial statements. For mandated changes in accounting principles, the FASB often allows companies to choose to account for the change retrospectively or as a separately reported item below extraordinary items. A change in accounting principle refers to a change from one acceptable accounting method to another. There are many situations that allow alternative treatments for similar transactions. Common examples of these situations include the choice among FIFO, LIFO, and average cost for the measurement of inventory and among alternative revenue recognition methods. New standards issued by the FASB also require companies to change their accounting methods. 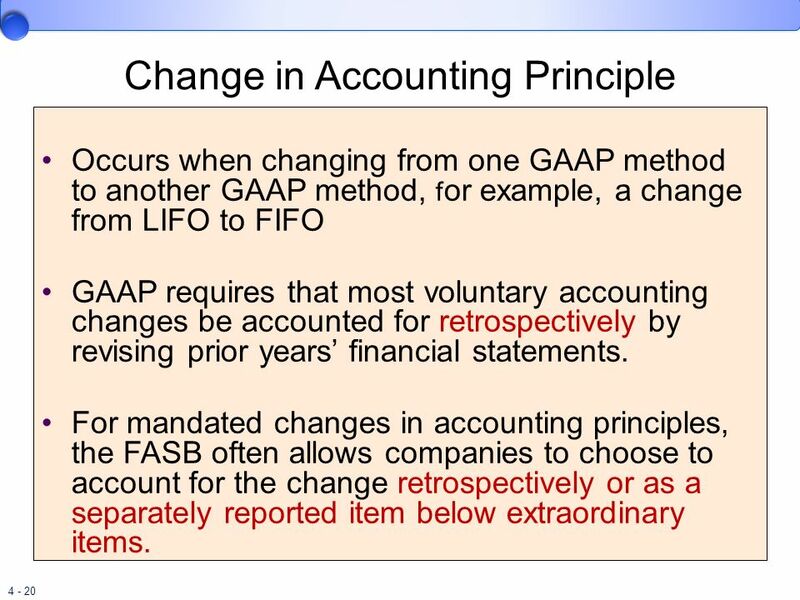 GAAP requires that voluntary accounting changes be accounted for retrospectively. For each year in the comparative statements reported, we revise the balance of each account affected to make those statements appear as if the newly adopted accounting method had been applied all along. Then, a journal entry is created to adjust all account balances affected to what those amounts would have been. An adjustment is made to the beginning balance of retained earnings for the earliest period reported in the comparative statements of shareholders’ equity to account for the cumulative income effect of changing to the new principle in periods prior to those reported. When a new FASB standard mandates a change in accounting principle, the board often allows companies to choose among multiple ways of accounting for the changes. One approach generally allowed is to account for the change retrospectively, exactly as we account for voluntary changes in principles. A second approach is to allow companies to report the cumulative effect on the income of previous years from having used the old method rather than the new method in the income statement of the year of change as a separately reported item below extraordinary items. 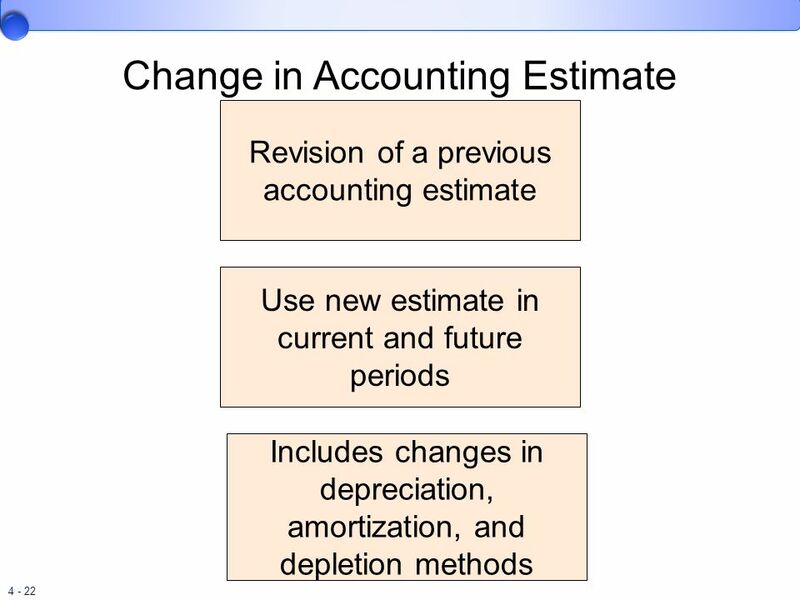 A change in depreciation, amortization, or depletion method is treated the same as a change in accounting estimate. 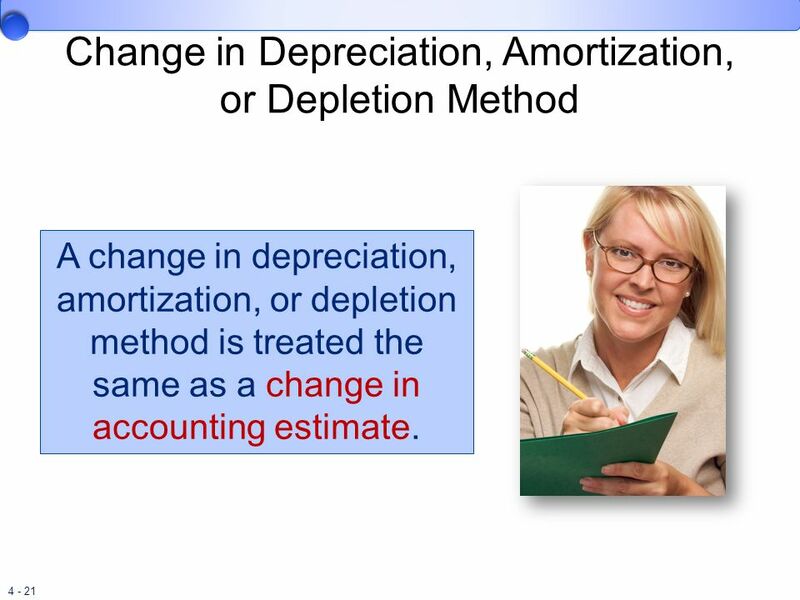 A change in depreciation, amortization, or depletion method is considered to be a change in accounting estimate that is achieved by a change in accounting principle. We account for these changes prospectively, exactly as we would any other change in estimate. When one company acquires another one, the financial statements of the acquirer include the acquiree as of the date of acquisition, and the acquirer’s prior-period financial statements that are presented for comparative purposes are not restated. The prior-period financial statements that are presented for comparative purposes should be restated to appear as if the new entity existed in those periods. 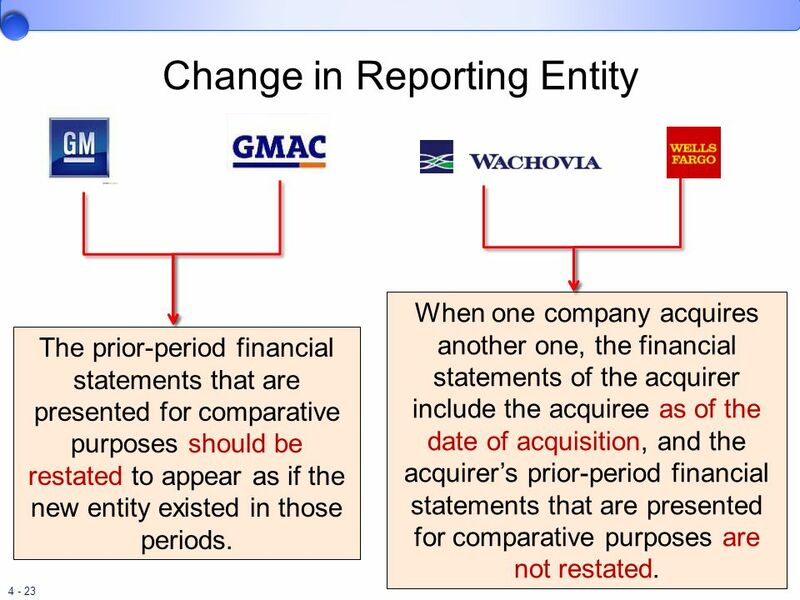 Part I A third type of change—the change in reporting entity —involves the preparation of financial statements for an accounting entity other than the entity that existed in the previous period. Some changes in reporting entity are a result of changes in accounting rules. For example, GAAP requires companies like Ford, General Motors and General Electric to consolidate their manufacturing operations with their financial subsidiaries, creating a new entity that includes them both. For those changes in entity, the prior-period financial statements that are presented for comparative purposes should be restated to appear as if the new entity existed in those periods. Part II However, the more frequent change in entity occurs when one company acquires another one. In those circumstances, the financial statements of the acquirer include the acquiree as of the date of acquisition, and the acquirer’s prior-period financial statements that are presented for comparative purposes are not restated. This makes it difficult to make year-to-year comparisons for a company that frequently acquires other companies. Acquiring companies are required to provide a disclosure note that presents key financial statement information as if the acquisition had occurred before the beginning of the previous year. At a minimum, the supplemental pro forma information should display revenue, income before extraordinary items, net income, and earnings per share. Errors occur when transactions are either recorded incorrectly or not recorded at all. Errors Discovered in Same Year Reverse original erroneous journal entry and record the appropriate journal entry. Record a prior period adjustment to the beginning retained earnings balance in a statement of shareholders’ equity. Previous years’ financial statements that are incorrect as a result of the error are retrospectively restated to reflect the correction. Material Errors Discovered in Subsequent Year Errors occur when transactions are either recorded incorrectly or not recorded at all. Accountants employ various control mechanisms to ensure that transactions are accounted for correctly. In spite of this, errors occur. When errors do occur, they can affect any one or several of the financial statement elements on any of the financial statements a company prepares. In fact, many kinds of errors simultaneously affect more than one financial statement. When errors are discovered, they should be corrected. Most errors are discovered in the same year that they are made. These errors are simple to correct. The original erroneous journal entry is reversed and the appropriate entry is recorded. The correction of material errors discovered in a subsequent year is considered to be a prior period adjustment. A prior period adjustment refers to an addition to or reduction in the beginning retained earnings balance in a statement of shareholders’ equity (or statement of retained earnings if that’s presented instead). When it’s discovered that the ending balance of retained earnings in the period prior to the discovery of an error was incorrect as a result of that error, the balance is corrected. However, simply reporting a corrected amount might cause misunderstanding for someone familiar with the previously reported amount. Explicitly reporting a prior period adjustment on the statement of shareholders’ equity (or statement of retained earnings) avoids this confusion. In addition to reporting the prior period adjustment to retained earnings, previous years’ financial statements that are incorrect as a result of the error are retrospectively restated to reflect the correction. Also, a disclosure note communicates the impact of the error on income. 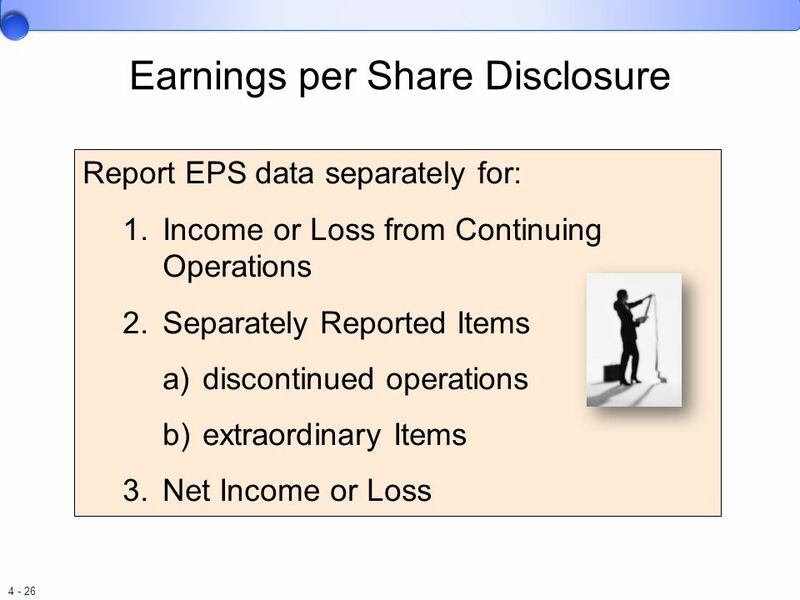 Report EPS data separately for: Income or Loss from Continuing Operations Separately Reported Items discontinued operations extraordinary Items Net Income or Loss Companies must disclose per share amounts for (1) income or loss before any separately reported items, (2) each separately reported item, and (3) net income or loss. 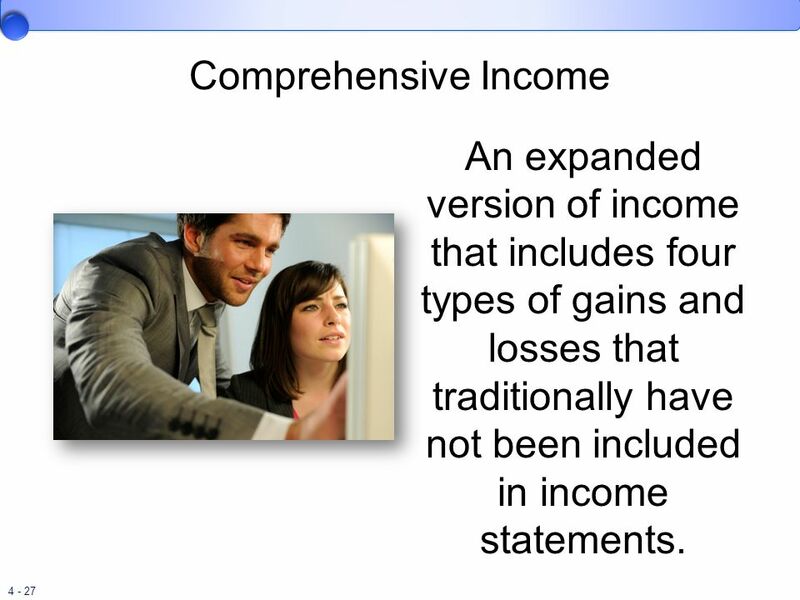 27 Comprehensive Income An expanded version of income that includes four types of gains and losses that traditionally have not been included in income statements. Comprehensive income is the total change in equity for a reporting period other than from transactions with owners. Comprehensive income includes net income as well as other gains and losses that change shareholders’ equity but are not included in traditional net income. Comprehensive income includes traditional net income as well as four additional gains and losses that change shareholders’ equity. Net unrealized holding gains (losses) from investments (net of tax). Gains and losses due to reviewing assumptions or market returns differing from expectations and prior service cost from amending the postretirement benefit plan. When a derivative is designated as a cash flow hedge is adjusted to fair value, the gain or loss is deferred as a component of comprehensive income and included in earnings later, at the same time as earnings are affected by the hedged transaction. Gains or losses from changes in foreign currency exchange rates. The amount could be an addition to or reduction in shareholders’ equity. (This item is discussed elsewhere in your accounting curriculum). The calculation of net income omits certain types of gains and losses that are included in comprehensive income. Companies must report both net income and comprehensive income and reconcile the difference between the two. The following items are part of comprehensive income: net unrealized holding gains (losses) from investments (net of tax). gains and losses due to revising assumptions or market returns differing from expectations and prior service cost from amending the postretirement benefit plan. when a derivative is designated as a cash flow hedge is adjusted to fair value, the gain or loss is deferred as a component of comprehensive income and included in earnings later, at the same time as earnings are affected by the hedged transaction. gains or losses from changes in foreign currency exchange rates. The amount could be an addition to or reduction in shareholders’ equity. (This item is discussed elsewhere in your accounting curriculum). 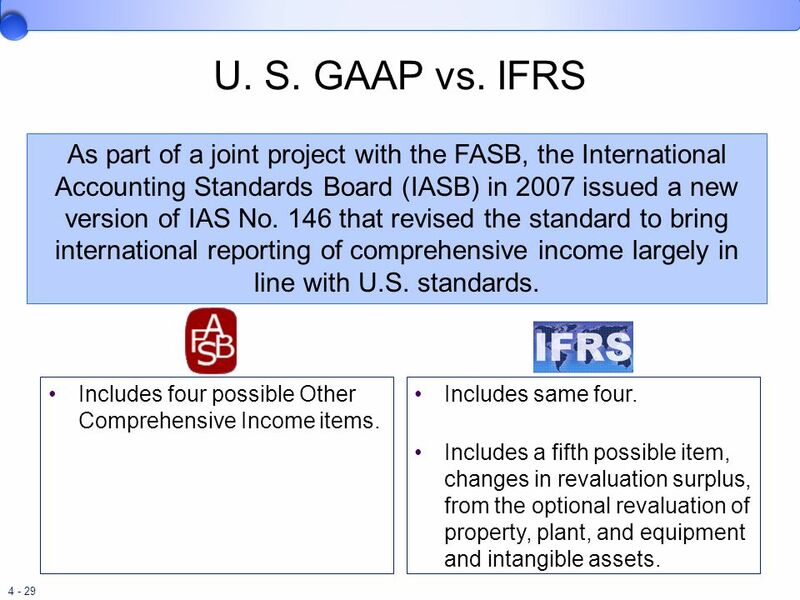 29 U. S. GAAP vs. IFRS As part of a joint project with the FASB, the International Accounting Standards Board (IASB) in 2007 issued a new version of IAS No. 146 that revised the standard to bring international reporting of comprehensive income largely in line with U.S. standards. Includes four possible Other Comprehensive Income items. As part of a joint project with the FASB, the International Accounting Standards Board (IASB) in 2007 issued a new version of IAS No. 146 that revised the standard to bring international reporting of comprehensive income largely in line with U.S. standards. It provides the option of presenting revenue and expense items and components of OCI either in (a) a single statement of comprehensive income or (b) in a separate income statement followed by a statement of comprehensive income. U.S. GAAP also allows the reporting of other comprehensive income in the statement of shareholders’ equity. Earlier we listed four possible OCI items according to U.S. GAAP. There is an additional possible item, changes in revaluation surplus, under IFRS. In Chapter 10 you will learn that IAS No. 16 permits companies to value property, plant, and equipment at (1) cost less accumulated depreciation or (2) fair value (revaluation). IAS No. 38 provides a similar option for the valuation of intangible assets. U.S. GAAP prohibits revaluation. If the revaluation option is chosen and fair value is higher than book value, the difference, changes in revaluation surplus, is reported as other comprehensive income and then accumulates in a revaluation surplus account in equity. Includes same four. Includes a fifth possible item, changes in revaluation surplus, from the optional revaluation of property, plant, and equipment and intangible assets. In addition to reporting comprehensive income that occurs in the current period, we must also report these amounts on a cumulative basis in the balance sheet as an additional component of shareholders’ equity. In addition to reporting OCI that occurs in the current reporting period, we must also report these amounts on a cumulative basis in the balance sheet. 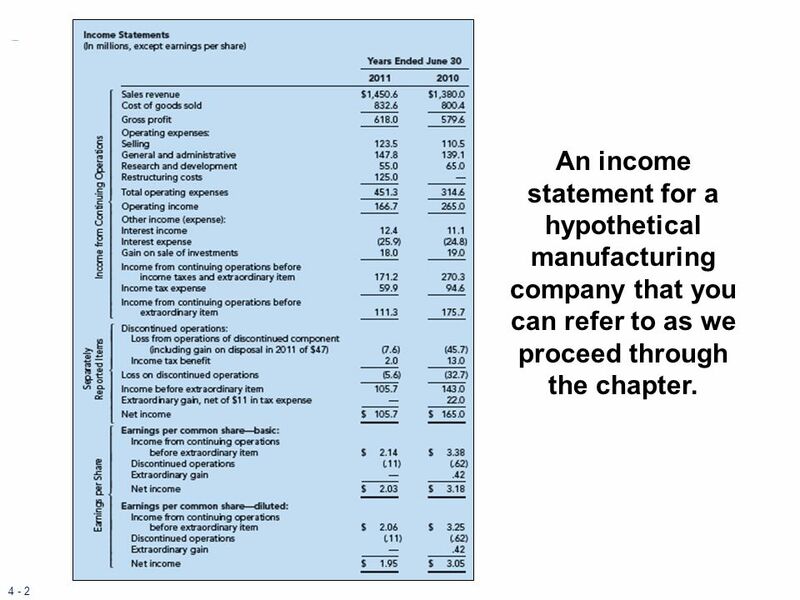 This is consistent with the way we report net income that occurs in the current reporting period in the income statement and also report accumulated net income (that hasn’t been distributed as dividends) in the balance sheet as retained earnings. Similarly, we report OCI as it occurs in the current reporting period and also report accumulated other comprehensive income (AOCI) in the balance sheet. This is demonstrated on this slide for Astro-Med Inc. Provides relevant information about a company’s cash receipts and cash disbursements. Helps investors and creditors to assess future net cash flows liquidity long-term solvency. Required for each income statement period reported. 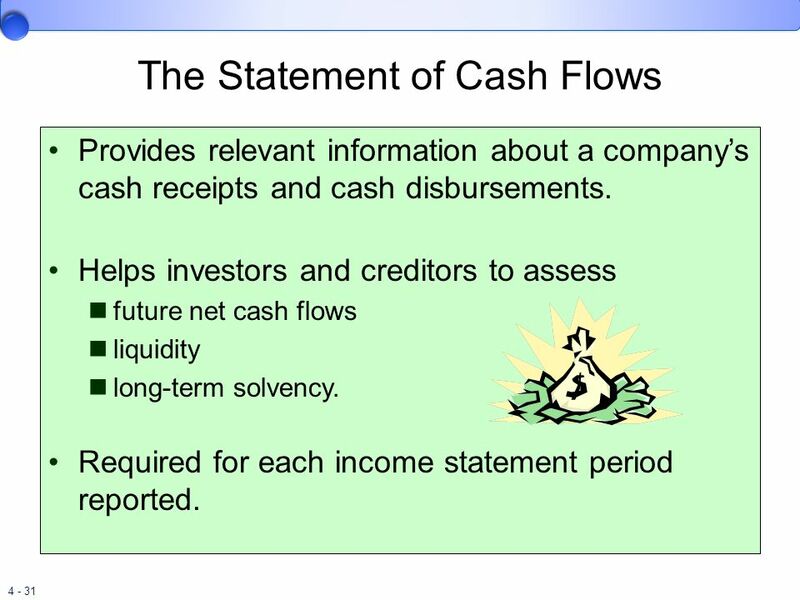 The purpose of the statement of cash flows is to provide information about the cash receipts and cash disbursements of an enterprise that occurred during a period. The statement of cash flows helps investors and creditors assess future net cash flows, liquidity, and long-term solvency. A statement of cash flows is required for each income statement period reported. Inflows from: sales to customers. interest and dividends received. 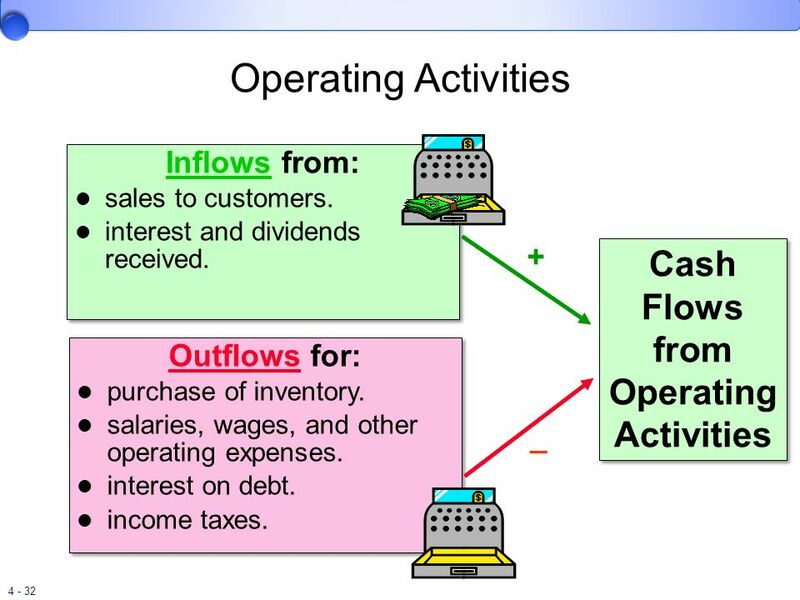 + Cash Flows from Operating Activities Outflows for: purchase of inventory. salaries, wages, and other operating expenses. interest on debt. income taxes. _ Operating activities are inflows and outflows of cash related to the transactions entering into the determination of net operating income. A few examples of cash inflows and outflows from operating activities are listed on this slide. The difference between the inflows and the outflows is called net cash flows from operating activities. This is equivalent to net income if the income statement had been prepared on a cash basis rather than an accrual basis. 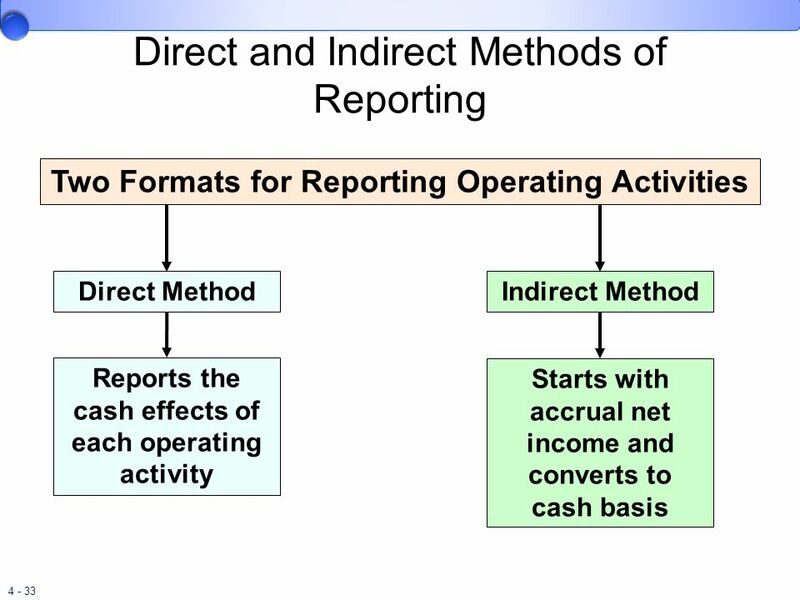 Two Formats for Reporting Operating Activities Reports the cash effects of each operating activity Direct Method Starts with accrual net income and converts to cash basis Indirect Method Two generally accepted formats can be used to report operating activities, the direct method and the indirect method. 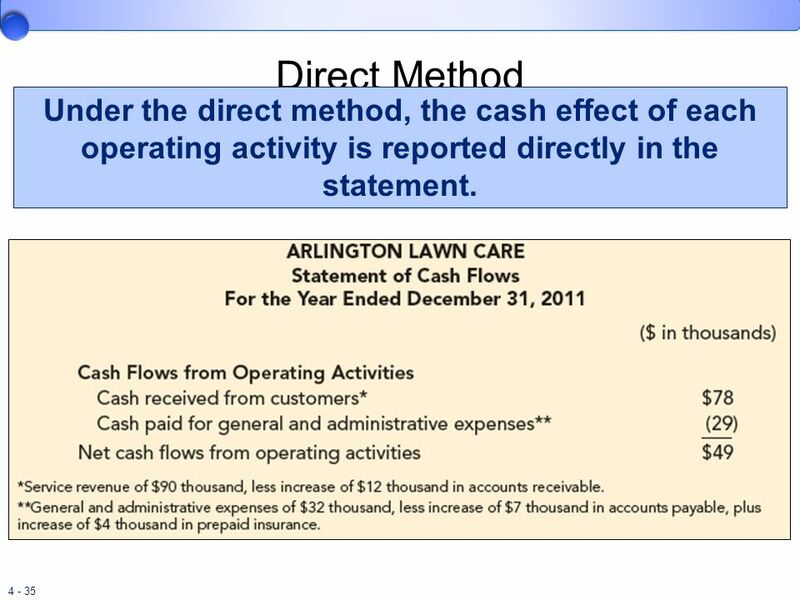 By the direct method, the cash effect of each operating activity is reported directly in the statement of cash flows. By the indirect method, cash flow from operating activities is derived indirectly by starting with reported net income and adding or subtracting items to convert that amount to a cash basis. 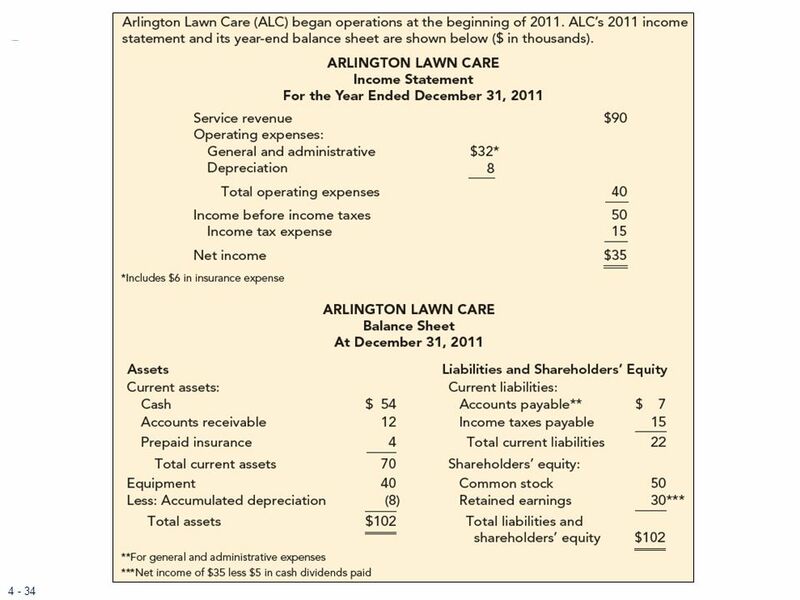 34 To contrast the direct and indirect methods further, consider the example for Arlington Lawn Care (ALC), which began operations at the beginning of ALC’s 2011 income statement and its year-end balance sheet are shown on this slide. Notice that retained earnings consists of the net income of $35,000 less cash dividends paid of $5,000. While the net income is $35,000, the cash flow from these same activities is not necessarily the same amount. From the income statement, we see that ALC’s net income has four components. Three of those—service revenue, general and administrative expenses, and income tax expense—affect cash flows, but not by the accrual amounts reported in the income statement. One component—depreciation—reduces net income but not cash; it’s simply an allocation over time of a prior year’s expenditure for a depreciable asset. 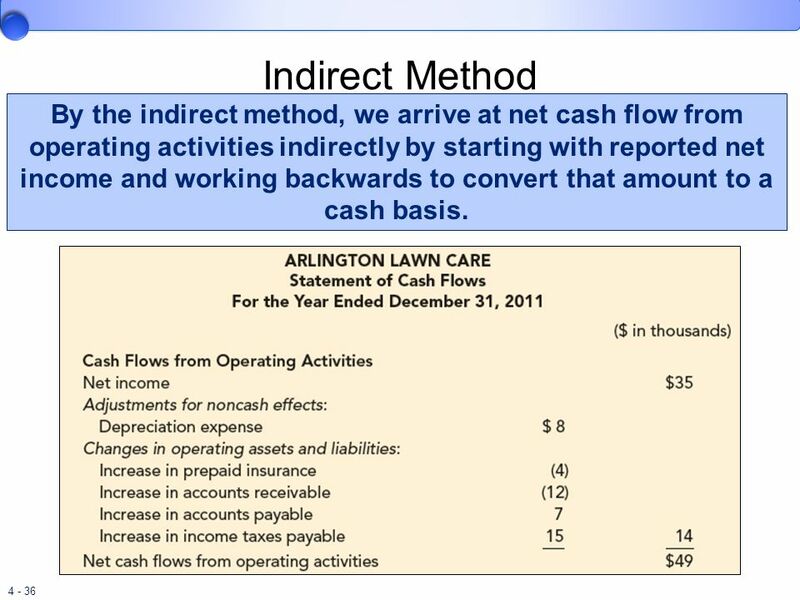 On the next slide we will see how ALC’s operating section of the statement of cash flows uses this information under both the direct and indirect methods. 35 Direct Method Under the direct method, the cash effect of each operating activity is reported directly in the statement. Under the direct method, the cash effect of each operating activity is reported directly in the statement. For example, cash received from customers is reported as the cash effect of sales activities. Income statement transactions that have no cash flow effect, such as depreciation, are simply not reported. You will recall from the previous slide that ALC’s service revenue is $90,000, but ALC did not collect that much cash from its customers. We know that because accounts receivable increased from $0 to $12,000, so ALC must have collected to date only $78,000 of the amount earned. Similarly, general and administrative expenses of $32,000 were incurred, but $7,000 of that hasn’t yet been paid. We know that because accounts payable increased by $7,000. Also, prepaid insurance increased by $4,000 so ALC must have paid $4,000 more cash for insurance coverage than the amount that expired and was reported as insurance expense. That means cash paid thus far for general and administrative expenses was only $29,000 ($32,000 less the $7,000 increase in accounts payable plus the $4,000 increase in prepaid insurance). The other expense, income tax, was $15,000, but that’s the amount by which income taxes payable increased so no cash has yet been paid for income taxes. 36 Indirect Method By the indirect method, we arrive at net cash flow from operating activities indirectly by starting with reported net income and working backwards to convert that amount to a cash basis. To report operating cash flows using the indirect method, we take a different approach. We start with ALC’s net income but realize that the $35,000 includes both cash and noncash components. We need to adjust net income, then, to eliminate the noncash effects so that we’re left with only the cash flows. We start by eliminating the only noncash component of net income in our illustration—depreciation expense. Depreciation of $8,000 was subtracted in the income statement, so we simply add it back in to eliminate it. That leaves us with the three components that do affect cash but not by the amounts reported. For those, we need to make adjustments to net income to cause it to reflect cash flows rather than accrual amounts. For instance, we saw earlier that only $78,000 cash was received from customers even though $90,000 in revenue is reflected in net income. That means we need to include an adjustment to reduce net income by $12,000, the increase in accounts receivable. In a similar manner, we include adjustments for the changes in accounts payable, income taxes payable, and prepaid insurance to cause net income to reflect cash payments rather than expenses incurred. For accounts payable and taxes payable, because more was subtracted in the income statement than cash paid for the expenses related to these two liabilities, we need to add back the differences. Note that if these liabilities had decreased, we would have subtracted, rather than added, the changes. For prepaid insurance, because less was subtracted in the income statement than cash paid, we need to subtract the difference—the increase in prepaid insurance. If this asset had decreased, we would have added, rather than subtracted, the change. Inflows from: sale of long-lived assets used in the business. sale of investment securities (stocks and bonds). collection of nontrade receivables. + Cash Flows from Investing Activities _ Outflows for: purchase of long-lived assets used in the business. purchase of investment securities (stocks and bonds). loans to other entities. Investing activities involve the acquisition and sale of (1) long-lived assets used in the business and (2) nonoperating investment assets. 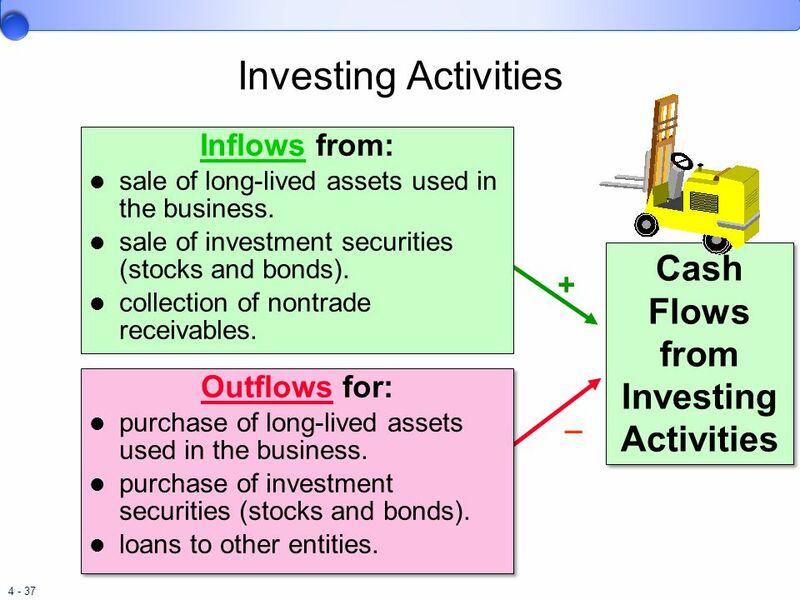 A few examples of cash inflows and outflows from investing activities are listed on this slide. Inflows from: sale of shares to owners. borrowing from creditors through notes, loans, mortgages, and bonds. Cash Flows from Financing Activities + Outflows for: owners in the form of dividends or other distributions. owners for the reacquisition of shares previously sold. creditors as repayment of the principal amounts of debt. _ Financing activities involve cash inflows and outflows from transactions with creditors and owners. 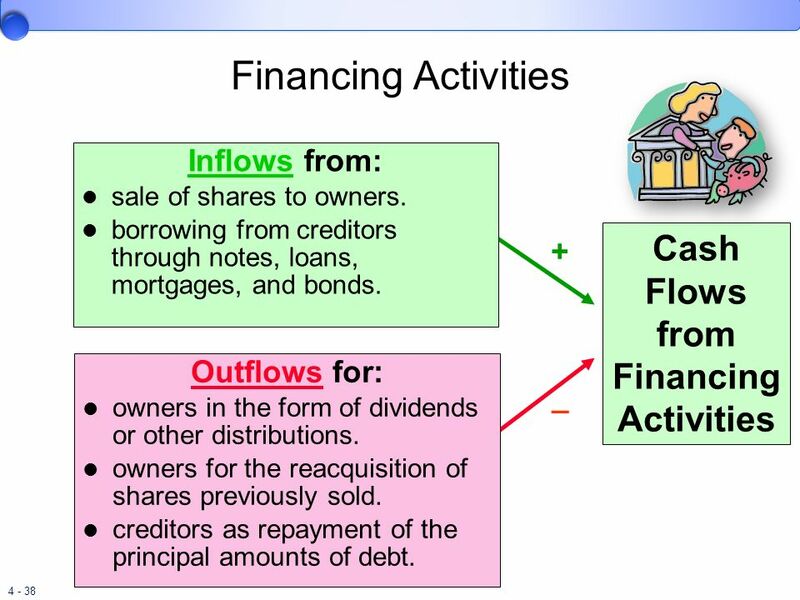 A few examples of cash inflows and outflows from financing activities are listed on this slide. 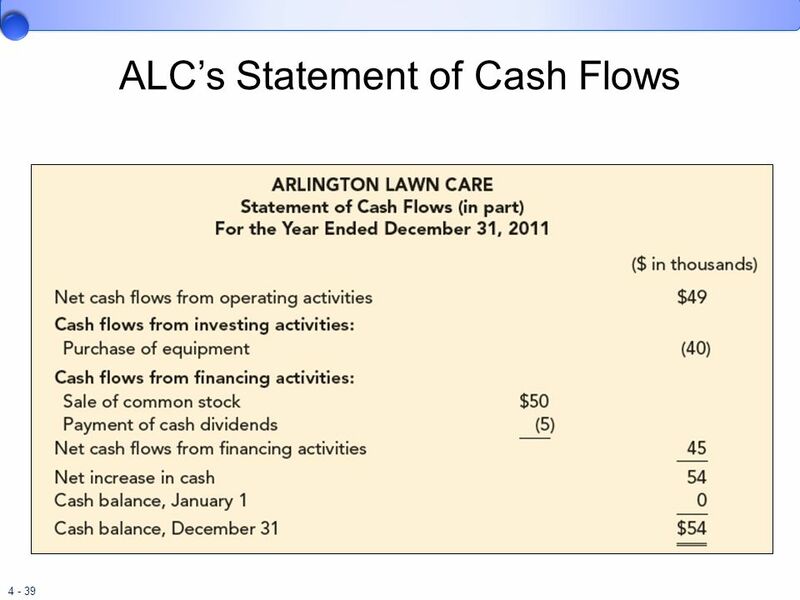 This slide illustrates ALC’s statement of cash flows. Earlier we showed how to arrive at net cash flows from operating activities using either the direct or indirect method. Net cash flows from investing activities represents the difference between the inflows and outflows of the investing activities. The only investing activity for ALC is the investment of $40,000 cash for equipment. We know $40,000 was paid to buy equipment because that balance sheet account increased from no balance to $40,000. Net cash flows from financing activities is the difference between the inflows and outflows of the financing activities. ACL has two financing activities. First, a review of the balance sheet indicates that common stock increased from $0 to $50,000, so we include that amount as a cash inflow from financing activities. 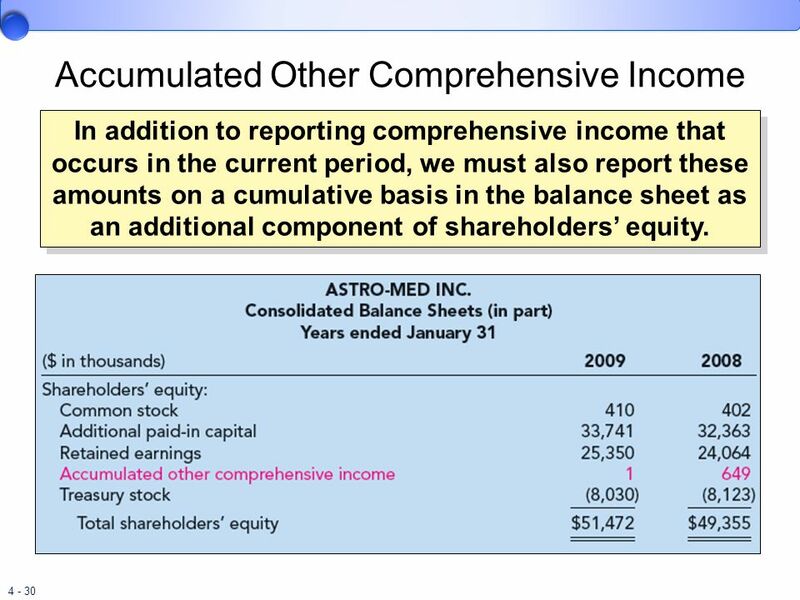 Second, information provided with ACL’s financial statements on an earlier slide told us that $5,000 was paid as a cash dividend, which is also a financing activity. Significant investing and financing transactions not involving cash also are reported. Acquisition of equipment (an investing activity) by issuing a long-term note payable (a financing activity). As we just discussed, the statement of cash flows provides useful information about the investing and financing activities in which a company is engaged. Even though these primarily result in cash inflows and cash outflows, there may be significant investing and financing activities occurring during the period that do not involve cash flows at all. In order to provide complete information about these activities, any significant noncash investing and financing activities (that is, noncash exchanges) are reported either on the face of the statement of cash flow or in a disclosure note. 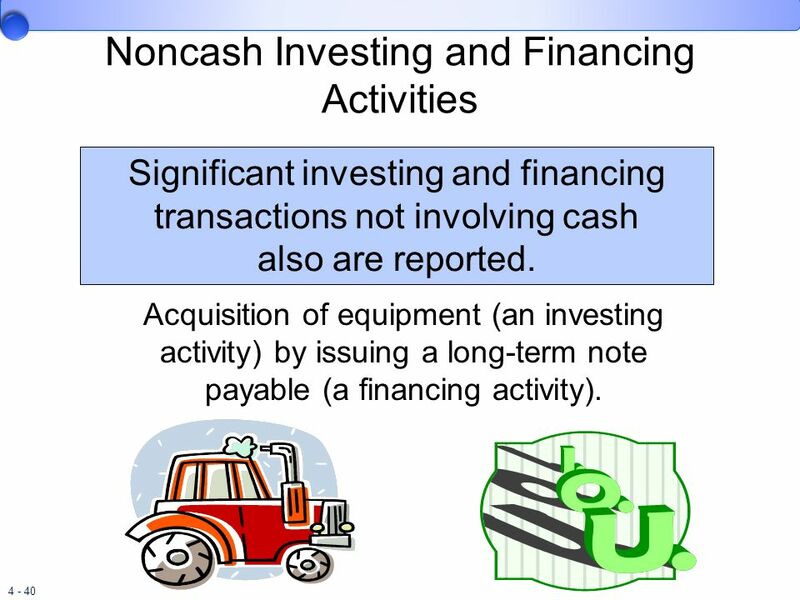 An example of a significant noncash investing and financing activity is the acquisition of equipment (an investing activity) by issuing either a long-term note payable or equity securities (a financing activity). 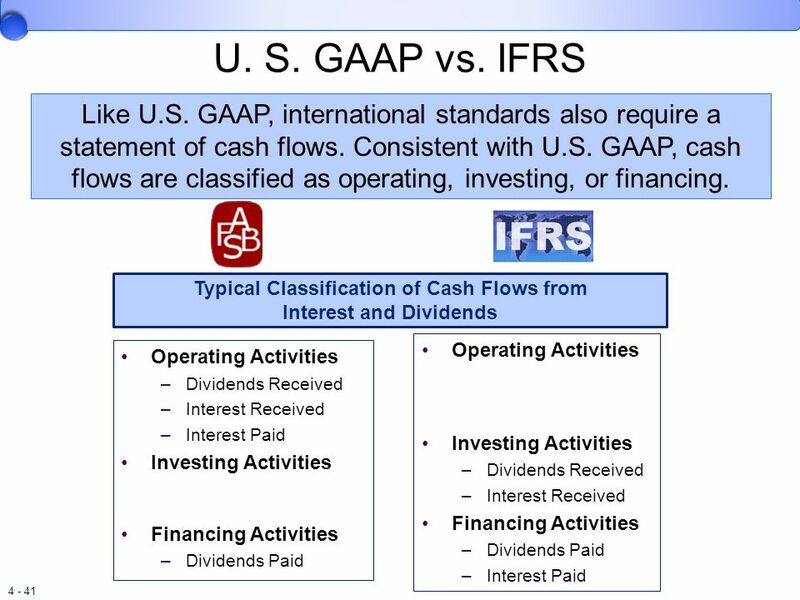 U. S. GAAP vs. IFRS Like U.S. GAAP, international standards also require a statement of cash flows. Consistent with U.S. GAAP, cash flows are classified as operating, investing, or financing. Typical Classification of Cash Flows from Interest and Dividends Operating Activities Investing Activities Dividends Received Interest Received Financing Activities Dividends Paid Interest Paid Operating Activities Dividends Received Interest Received Interest Paid Investing Activities Financing Activities Dividends Paid Like U.S. GAAP, international standards also require a statement of cash flows. Consistent with U.S. GAAP, cash flows are classified as operating, investing, or financing. However, the U.S. standard designates cash outflows for interest payments and cash inflows from interest and dividends received as operating cash flows. Dividends paid to shareholders are classified as financing cash flows. IAS No. 7, on the other hand, allows more flexibility. Companies can report interest and dividends paid as either operating or financing cash flows and interest and dividends received as either operating or investing cash flows. Interest and dividend payments usually are reported as financing activities. Interest and dividends received normally are classified as investing activities. 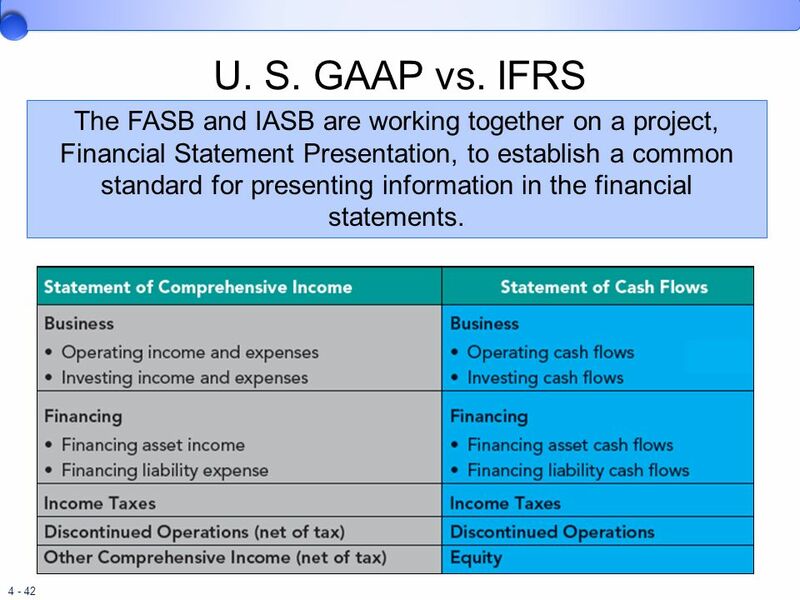 42 U. S. GAAP vs. IFRS The FASB and IASB are working together on a project, Financial Statement Presentation, to establish a common standard for presenting information in the financial statements. The FASB and IASB are working together on a project, Financial Statement Presentation, to establish a common standard for presenting information in the financial statements, including classifying and displaying line items and aggregating line items into subtotals and totals. This standard will have a dramatic impact on the format of financial statements. An important part of the proposal involves the organization of elements of the balance sheet (statement of financial position), statement of comprehensive income (including the income statement), and statement of cash flows (SCF) into a common set of classifications. The income statement (statement of comprehensive income) and the statement of cash flows are slated to change in several ways. First, though, we should note that the SCF retains the three major classifications of cash flows. The income statement (and balance sheet as well) also will include classifications by operating, investing, and financing activities, providing a “cohesive” financial picture that stresses the relationships among the financial statements. For each statement, though, operating and investing activities will be included within a new category, “business” activities. Each statement also will include three additional groupings: discontinued operations, income taxes, and equity (if needed). 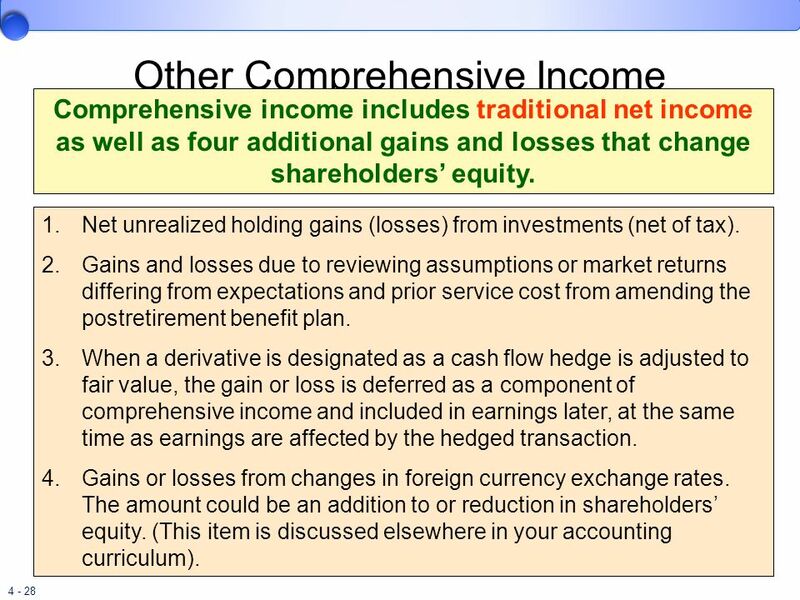 The new look for the statement of comprehensive income and the statement of cash flows will be as shown on this slide. 43 End of Chapter 4 End of chapter 4. 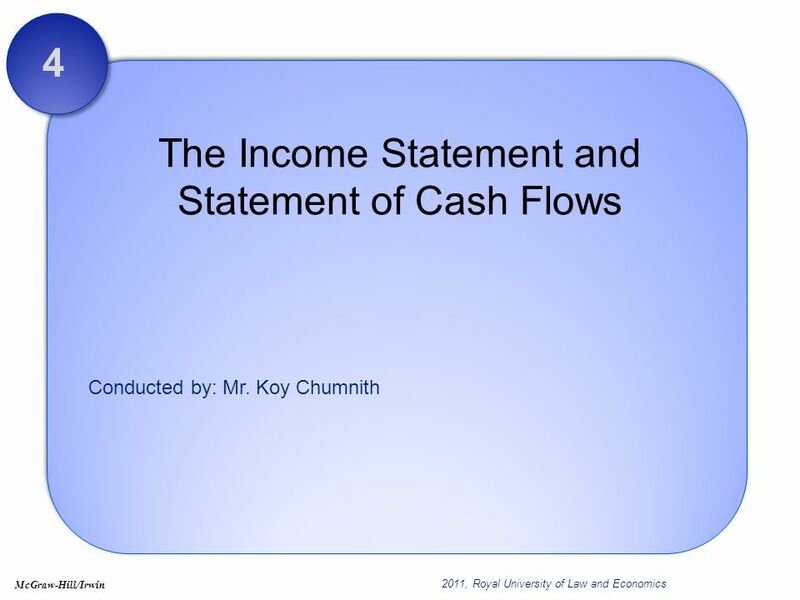 Download ppt "The Income Statement and Statement of Cash Flows"
The Income Statement, Comprehensive Income, and the Statement of Cash Flows Chapter 4 Chapter 4: The Income Statement, Comprehensive Income, and the. McGraw-Hill /Irwin© 2009 The McGraw-Hill Companies, Inc. ACCOUNTING CHANGES AND ERROR CORRECTIONS Chapter 20. PowerPoint Authors: Susan Coomer Galbreath, Ph.D., CPA Charles W. Caldwell, D.B.A., CMA Jon A. Booker, Ph.D., CPA, CIA Cynthia J. Rooney, Ph.D., CPA Copyright. The Income Statement and Statement of Cash Flows Sid Glandon, DBA, CPA Associate Professor of Accounting. 1 © Copyright Doug Hillman 1999 Additional Stockholders’ Equity Transactions and Income Disclosures. 17-1 Learning Objectives After studying this chapter, you should be able to:  Indicate the usefulness of the statement of cash flows. Distinguish.